Trigger Happy are here to provide that added element of fun to what is already such a monumental day. The coming together of two families, united in holy matrimony. A day surrounded by loved ones – filled with joy, laughter, smiles and tears. A day that dreams are made off and one that surely can’t be missed. Our photobooths offer the chance to capture every inch of the celebrations, equipped with a camera, green screen, facial recognition, videoke and video recording, each guest can leave there own personal print on your special day. 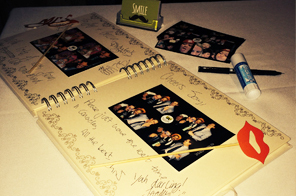 Doing away with the conventional guestbook, why not opt for a video or picture guestbook allowing each guest to leave a video recording or handwritten message along with a photo. Confession of love, snapshots of the family and even proud grandparents covered in props and a little too merry. Our photobooths have seen it all. Get in contact and enjoy that all important day over and over again. Our customisable green screen enables the memory of your party to be etched into your photographs; providing the perfect backdrop for your photos. You can choose from our stock of backdrops, or we can create a unique design to compliment your event. With Trigger Happy, you are guaranteed a memorable party for you and your guests; not only with our high quality photographs, but with our extensive prop box as well. 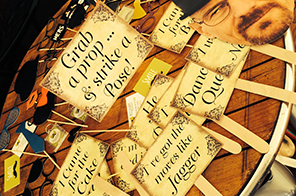 Our prop box, which can be customisable to suit your party’s theme, will ensure guests of all ages will be laughing all night long, leaving them talking about your party for weeks. Advertising, Marketing, Product Launch, Team Building, Summer Party? The possibilities are endless. 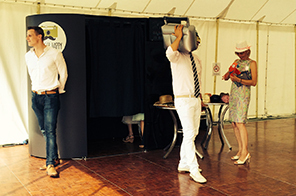 Here at Trigger Happy we offer a premium photobooth hire service that will enhance any corporate event. Our fully customisable booths allow for immediate brand recognition. Teamed with the ability to personalise text, add logos or even add vouchers to the digital prints. We really can enhance your corporate event – Trigger Happy will help you gain an immediate impact on your audience. Please get in contact and see what we can do.